From the largest and famous Fengjia Night Market (逢甲夜市) in Taichung, Taiwan, emerged a delicious new concept Taiwanese snack called Squidto (黄金贼) which had endless queues of seafood enthusiasts lining up nightly to have their boost of the mouth watering snack. 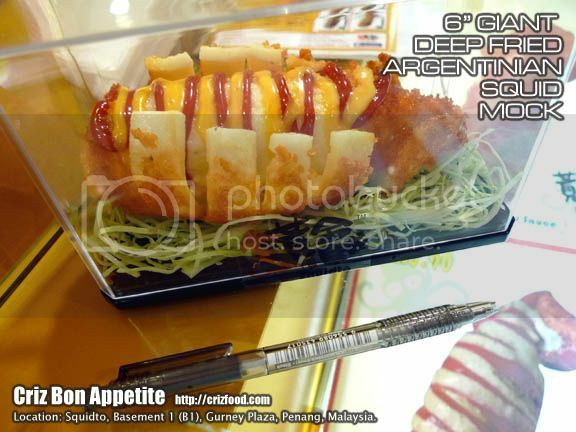 This succulent deep fried Argentina-imported giant squid stuffed with seafood baked rice snack has finally arrived with the sole franchise outside Taiwan outlet located at Basement 1 Gurney Plaza, Penang. 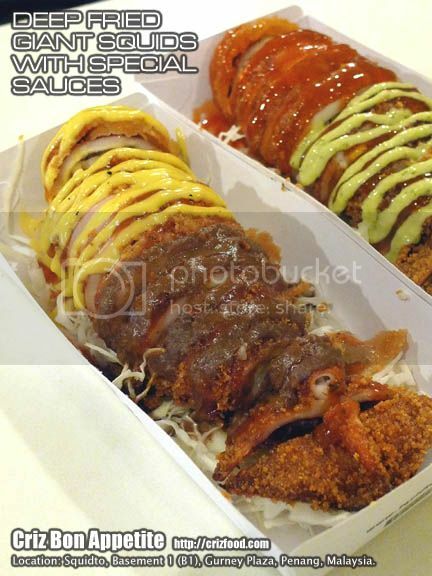 Just take a look at the mock at the counter and you would be amazed at how gigantic each squid snack is in comparison to the pen size. Each of the Argentina-imported giant squid would be evenly sized at approximately 6 inches each. Wow! That would be huge for a snack. Some diners were believed to even consume it as a main meal since it had the 3 basic items such as vegetables (julienned cabbage), protein (deep fried squid) and starch (seafood baked rice). 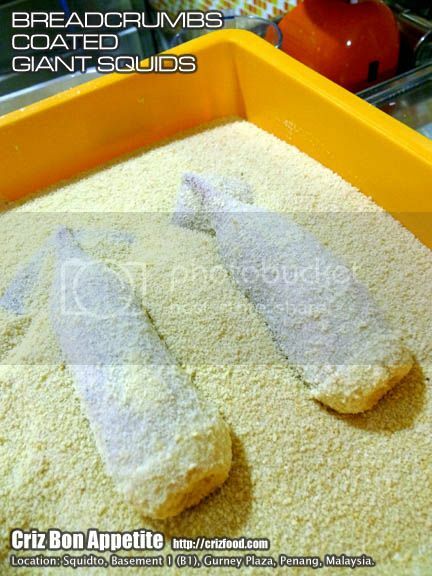 Prior to being deep fried in a timely preset fryer, each of the squid would be coated in a specially imported breadcrumbs mixture which gave the snack a crispy exterior while maintaining the moist and juiciness within. 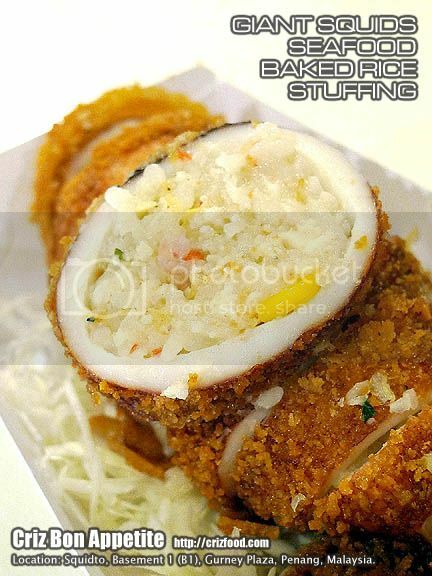 The stuffing for the squid can be quite filling as it used a special graded rice grains which had the glutinous rice texture. Cooked almost similar to how the Italians would cook their risotto, this creamy stuffing had many secret ingredients added in. Visually you can find some finely diced kani crabstick, baby anchovies, baby dried shrimps, finely chopped squid bits and corn kernels with light hints of sweetness and saltiness coming from some onions, butter and cheese. It was not bad at all as the taste from the stuffing was not too strong to overpower the freshness of the squid. 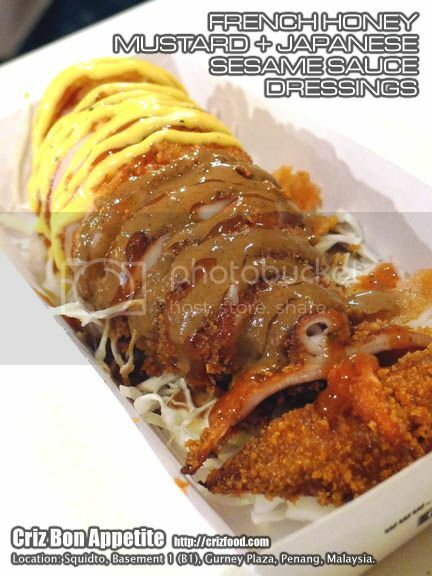 Basically, the squids were all coated and deep fried in the same way, except for the choice of different dressings. 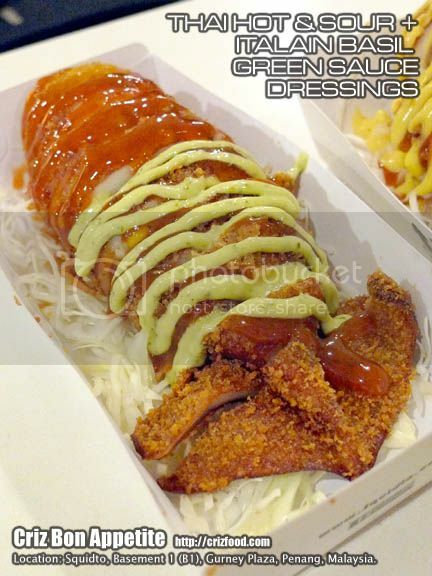 There are 4 standard international flavors available such as the French Honey Mustard Sauce (法式蜂蜜芥末醬), Japanese Sesame (Goma) Sauce (日式和風芝麻沙拉醬), Thai Hot & Sour Sauce (泰式酸辣醬) and Italian Basil Green Sauce（意式羅勒青醬). 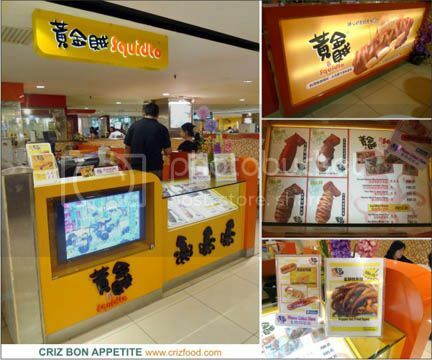 Other local flavors would also be available for limited period such as the currently promote Cheesy Sauce (奶酪醬). Though the French and Thai sauces remained the two top favorite in Taiwan, my personal liking would be for the French and Italian sauces. As for visual only, here are the 4 standard flavors as shown in the photo below. You are allowed to CHOOSE ONE FLAVOR ONLY. All the 4 standard orders would cost RM8.90nett each while other flavors under promotion might differ such as the Cheesy Sauce set at RM9.90nett. Other promotion included One Set Plus One Drink at RM10.80nett. Here’s a comparison between the flavors for the French Honey Mustard Sauce versus the Japanese Sesame (Goma) Sauce here. The former sauce is definitely the best choice for deep fried and grilled items. The Goma Sauce on the other hand needed some acquired taste. I would personally prefer the latter sauce to be dressed on vegetables rather than protein. The Thai Hot & Sour Sauce and Italian Basil Green Sauce were quite acceptable by all. The Taiwanese liked the Thai Hot & Sour Sauce more but I found it to be too mild to my liking. Instead, I prefer the Italian Basil Green Sauce more as I love the taste of herbs and spices more. 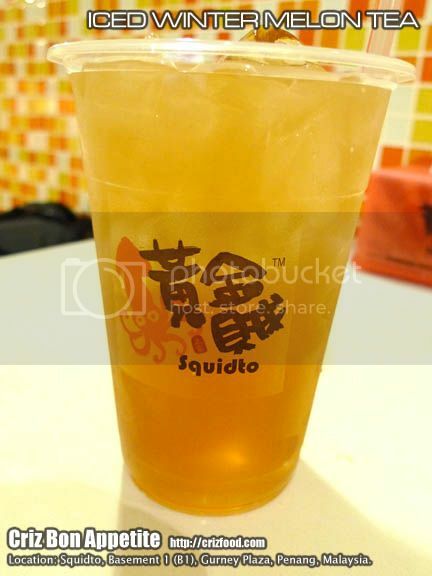 There are only 2 types of drinks available here such as the Iced Honey Green Tea (RM2.90nett) and Iced Winter Melon Tea (RM2.90nett). Both beverages were just at an acceptable level considering that they are not the expert in tea drinks. Overall, the flavors for the items are within the acceptable level. It would be best to consume the items at the outlet as takeaways might get cold too soon and affect the quality of crispiness and juiciness. Find your way to Gurney Plaza and use the escalator to go one level down to the basement. As you reach the basement, turn right and walk towards the middle and you would see the outlet right in between Scallop-Q and Mr Teppanyaki. You won’t miss it as it has a steady flow of customer there almost always. 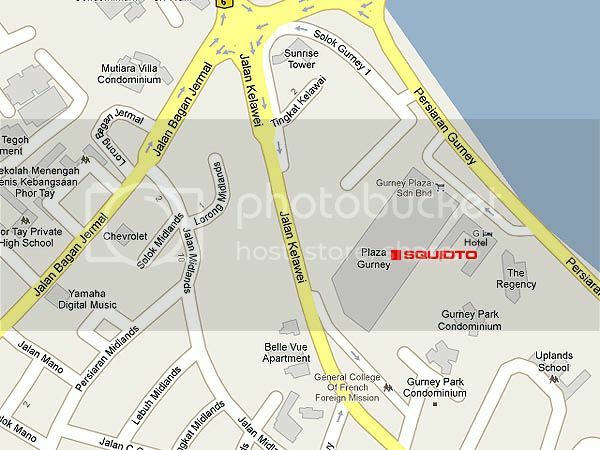 Address: 170-B1-K5, Plaza Gurney, Persiaran Gurney, 10250 Penang, Malaysia.